Hailing all the way from Keyport, New Jersey, progressive rock outfit East of the Wall have just released their newest LP NP-Complete this past March via Translation Loss Records. 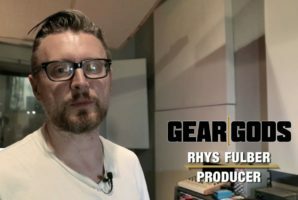 The 5-piece group have been making killer progressive music since 2005, and drummer Seth Rheam is here to demonstrate just how they do it with this exclusive drum playthrough for their new track “Tell Them I’m Sorry”, only right here, on Gear Gods! One of the tell-tale signs of a good progressive rock/metal song, in my opinion, is how naturally everything flows from section to section, and these guys absolutely hit the nail on the head with this track. In a genre that has very few rules, it can be easy to piece together songs that just devolve into “riff salad”, but EotW know how to combine the best parts of interesting songwriting with an overall jammy feel in just the right way to avoid ever overstaying their welcome. And that’s not even mentioning Seth’s playing here, which pushes the song forward energetically but organically. The man’s got groove, chops for days, and knows exactly when to sit back or take the reigns or visit best casinos online. Be sure to get NP-Complete on the band’s Bandcamp, as well as to follow them on Facebook and Instagram. You can also visit live odds at rsabet.co.za for your information.